Because so much of Mas' general news thread is him reporting on multiformat stuff, there's a risk of these flying under the radar if I talk about them there. Besides, who's to say they don't deserve a thread of their own? So, a thread for linking to, talking about, and hyping up Nintendo Directs and Treehouse streams, and other things that Ninty may show us via the web that don't quite deserve their own threads. As mentioned in the aforementioned news thread, Nintendo have just announced the following. As a person on a Smash blackout until the 3rd, I don't know whether to watch it or not. Dilemma. Always actually thought there should be a Direct thread to talk about anything that comes out of it but then we just end up talking about the games in there on thread. I honestly already thought that there was a direct thread and it always confused me when I couldn't find it. I'm working 6-10 tomorrow evening but I'll probably pop this on when I can. Well, it does say it's upcoming wii U/3ds games first then smash bros so maybe it will be ok to watch the first half of it? Think that's what I might go for. Duck quickly out when that flaming cross logo and the metallic sound effect happen. On that very day I'll be collecting in a huge number of tests that have to be marked over the weekend. I might see if I can catch some of it, though - the new and upcoming games bit interests me. Start time revealed: 1800 for us UK-ers. There's also a Smash 3D-specific broadcast on a Japanese site which none of us are registered with. Guess we'll have to wait for Nintendo Life to report it. And by "we" I mean "you". 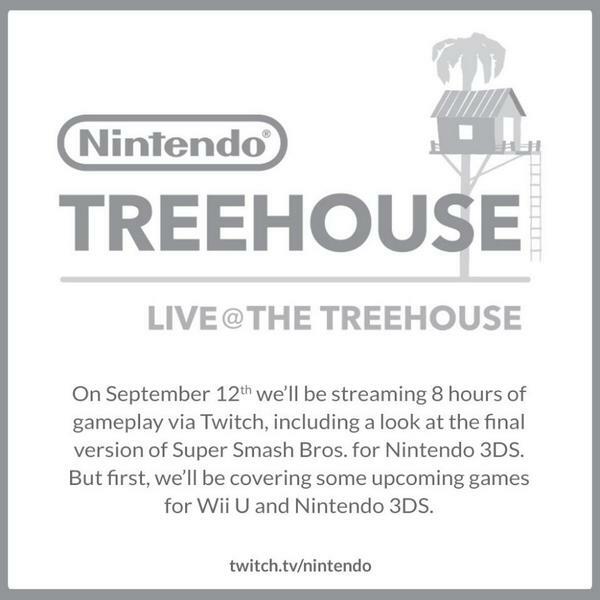 Rumors going around the net that the smash wiiu date will be announced during the stream. Looking at this tweet, it doesn't look like there'll be any big new showings, which is a shame. Still, at least they've told us that in advance, rather than letting us get our hopes up (which I would have done otherwise). Was anything decent shown, the only thing anyone seems to be reporting on it SMASH Demo. I forgot to give my views on (the first half of) this. I... didn't enjoy it much. I found the Bayo 2 section dull, and while the Fantasy Life section looked substantially better, it sounded like the saccharine squeaky valley-girl voice of Audrey Drake. I can't so much as remember the other non-Smash games. I think that my view on Treehouse is that's it's good for showing off games the first time, especially for Nintendo's gameplay-heavy not-at-their-best-in-a-cinematic-trailer offerings. But after that, the little additions shown bore me in all but the most exciting of games. Unless there's been a quantum leap in how the game looks/plays, a second showing is background noise at best. Aye I'd definitely agree with you there, however it is great marketing for those games especially if anyone had missed the other streams or were only tuning in for smash bros.
Smasu U Direct on the 23rd, 11pm. (Would have put it in the Smash U thread, but it would be my second double post in said thread.) Will feature "50 must-see things", apparently. Pleased as more info always good but would like to see a direct now with stuff coimg in 2015 as not been much E3 which was about 4-5 month's ago. I'm really unsure about watching this as I do like going into games as fresh as possible but it could be really tough to avoid the chatter about it on social media etc & how much new content can the wii U version have? I'm gonna watch it. For me, smash isn't a game that can be spoiled; the stories and hi jinks that'll emerge when I play it with the lads can't be spoiled and I want as much hype as possible shop the release can live up to brawl coming out back in the day. I do see what ye mean I've just got a massive hatred for spoilers of any kind I just miss the days where you'd freak out when you unlocked something in a game & now it's just "oh there's that thing I seen in a trailer/read online"
Jas, I'd wholeheartedly agree with you, only I completely failed to remain unspoilt for SSB3DS. I don't hold any hope of being any better off with SSBU. I did manage to do a decent job with Pokémon XY, but with Nintendo Life publishing almost every minor detail about the Smash games on their front page, and me being unable to stay away... It's not going to happen, so I may as well revel in the hype-building. Out of nowhere, as usual. Any idea what it's about? NL and CVG haven't caught up yet.